Awards shall be presented, as they are accrued, to all Craft members (excluding Lodge Officers). The awards presentation shall take place in open Lodge as soon as possible after points are tallied. In addition, there shall be an annual Dayton Lodge Craft Club appreciation dinner, the date of which to be announced by the Worshipful Master and the Craft Club Captain. 1) 10 pts Attendance at Lodge stated Meetings with no Degree work. 2) 15 pts Attendance at a Lodge meeting conferring an E.A., F.C. or MM Degree. 3) 20 pts Attendance at a Lodge meeting conferring a M.M. Degree and performing parts: 1 thru 6, 10 thru 12, Ship’s Captain or Wayfaring Man. 4) 25 pts Attendance at a Lodge meeting conferring a M.M. Degree and performing parts: 7, 8 or a Ruffian. 5) 30 pts Attendance at a Lodge meeting conferring a M.M. Degree and performing speaking part 9. 6) 5 pts Visitor at any Lodge – stated or installation. 7) 10 pts Visitor at any Lodge – conferring E.A, F.C. or M.M. Degree. 8) 15 pts Visitor at any Lodge – conferring E.A, F.C. or M.M. Degree and performing a speaking part. 9) 15 pts Attending an inspection in the 2nd Masonic District. 10) 15 pts Visitation at or performing a duty by order of the Lodge at the Ohio Masonic Home. 11) 10 pts Visitation to a Brother in the Hospital or at home, who is suffering ill health or injury. 12) 15 pts Visitation to any Dayton Lodge sponsored Youth Group meeting or activity. 13) 15 pts Attendance at a Masonic Funeral Service. 14) 25 pts Attendance at a Masonic Funeral Service and giving a Master or Chaplin speaking part. 15) 700 pts Learning a Degree lecture – approved by the Lodge Officers. 16) 350 pts Presenting a lecture when conferring a Degree. 17) 150 pts Learning Degree charges – approved by the Lodge Officers. 18) 75 pts Presenting a Charge when conferring a Degree. NOTE: The above points do not apply for Past Masters. Any pins or awards given to officers who present lectures and charges will be only be presented to Craft Club members at the discretion of the Worshipful Master. 19) 15 pts Attendance at a Dayton Craft rehearsal. 20) 15 pts Attendance at a Dayton Craft Club meeting. 21) 50 pts Serving as a Craft Club Officer for one year. 22) 100 pts Serving as Floor Captain for one year. 23) 25 pts Serving on the phone committee for one year. 24) 15 pts Working in the preparation room. 25) 5 pts Assisting the Tyler to set up and take down Lodge. 26) 5 pts Assisting the Tyler to get out and put away regalia for the M.M. Degree. 27) 15 pts Serving at Dayton Lodge dinners, dances and/or other entertainment. 28) 5 pts Assisting Stewards with Lodge refreshments when requested. 29) 5 pts Bring a visitor to Dayton Lodge. 30) 5 pts Providing rides to non-driving members to any Masonic function. 31) 50 pts Assisting at V.A. for Church Services for Dayton Lodge #147. 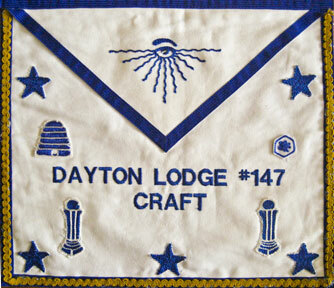 32) 100 pts Submitting a petition to Dayton Lodge #147 – when petitioner receives Master Mason Degree. 33) 10 pts Participating as a member of the Investigation Visitation Committee. 34) 50 pts Class/Candidate Instructor – when class/candidate examined in open Lodge. Points will be tallied starting with the month of September and ending with the last stated meeting at which the Lodge goes dark. Any points accrued between the last stated meeting at which the Lodge went dark and the following September, will be awarded during that next September, when the Lodge has returned to light. Questions or comments? See the Craft President, Ballard Yates, PM, or go to the CONTACT page. Brother Seubert will receive messages pertinent to the Craft sent through this form. When a secretary of George Washington, excusing himself for being late, said that his watch was too slow, the reply of Washington was, " You must get a new watch, or I must get a new secretary."